First to the East 3 and then to the West, 4. Then to the one that you love best. 6. Old Dan Tucker's stands a-looking. 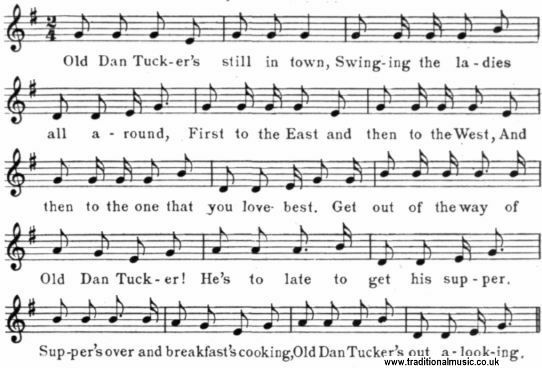 Old Dan Tucker's a fine old man, Washed his feet (or face) in tke frying pan, Combed his hair with a wagon wheel, And died with a tooth-ache in his heel. 1. Get out o' the way for Old Dan Tucker, He's too late to get his supper. Some are black and some are blacker, Some are the color of a chew a' terbacker. :Swing three ladies, Old Dan Tucker,: 3 times Down in the valley.